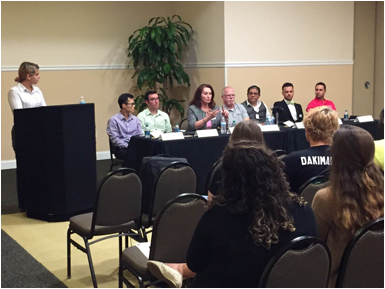 On Tuesday March, 24th 2015, UCF Career Services in partnership with LGBTQ+ Services hosted a panel of seven employers in the LGBTQ+ community to share their individual and professional experiences about being out in the workplace. The panelists included Lockheed Martin, NASA, SunTrust, Wyndham, Equality Florida, MBA Orlando and Embry Riddle Aeronautical University. Taking place in the UCF Student Union, students were able to network with these panelists and gain valuable insight on beginning their careers. Employers spoke on various topics of acceptance and diversity in the public and private sectors and the importance of job performance and talent. One panelist from Equality Florida, Gina Duncan, discussed the growing acceptance of transitioning in the workplace for anyone who identifies as transgender saying, “75% of Employers in the State of Florida are absolutely on board with employees transitioning on the job." There was also a focus of discussion on employers looking for hard workers and top talent regardless of their background.